Claire has long, beautiful hair. She also has a mind of her own. And one day she decides she will not wash her hair. At first, her hair is not so bad. But as the weeks go by, tangles grow to brambles. Luckily, even a very stubborn girl can change her mind. When Claire announces, 'I'll wash my hair! '; that's when the fun begins. You won't believe what crawls, walks, falls, and flies out of Claire's hair. Children of all ages will enjoy this vividly illustrated rhyming tale of a girl who learns her lesson...or does she? "Girls and boys will be tickled by this rhymed story of a girl who refused to wash her hair, sending her parents into despair and her cat fleeing. And when she finally did, well, they found a whole lot of stuff nestled up there, including a unicorn!"—St. Paul Pioneer Press, "Best Children's Books"
Ages 5 & up. Hardcover, dust jacket, full color, 12 1/4" x 7 3/4", 48 pages. 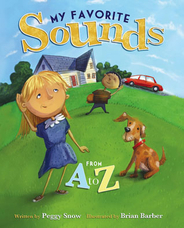 Rhyming poems and lush illustrations present an alphabet of sounds, from acorns cracking under bicycle wheels to zippers zipping on sleeping bags during family camping trips. In between, an alphabet of sounds to explore, experience, and share. Children will be inspired to listen more closely to sounds in their everyday lives, imagine sounds they haven't yet heard, experiment with creating new sounds, even sharpen their listening skills. Parents and teachers, this is a book you'll want to read aloud. 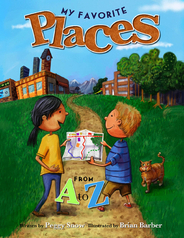 Vivid poems and illustrations describe an alphabet of places special to children. They'll journey from art room to zoo, with stops along the way at an ice cream cafe, a science museum, a library, a jungle gym, the ocean, and more. Children explore memories, imagine places they would like to go, and realize their world is expanding. Written in verse with an appealing variety of rhymes and rhythms, Places will touch both children—and adults, who may remember favorite places of their own. It's not easy raising a child with learning or behavior problems. And it's not easy being that child. 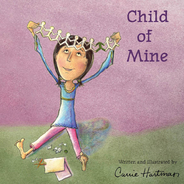 Parents of challenging children will relate to the emotions Carrie Hartman expresses in this beautiful and heartwarming book—and the hope she shares. Children who struggle with behavior issues, disorders, and disabilities will be reassured by words and pictures that communicate love, confidence, and faith in their future. A picture book for parents and children to share. Makes a perfect gift of support for parents and caregivers who are dealing with a challenging child.